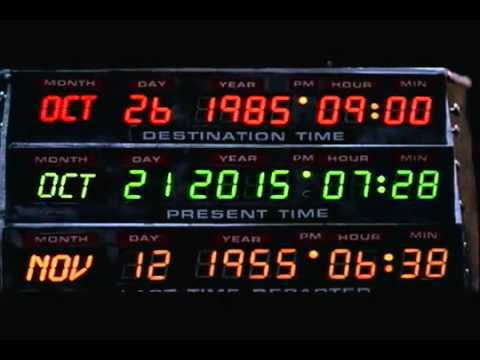 Pictures of Deloreans and hoverboards and clocktowers are filling my Facebook feed. The police officers in Michigan had a good time with it, reporting that they pulled over a silver Delorean for going 88 mph in a 55 mph zone. Lots of people are wondering why we don’t have cars that fly or jackets that shrink or pizzas that rehydrate yet. Some seem legitimately disappointed that these things don’t exist yet; one man said he had waited his whole life since he watched the movie as a kid for this date so he could see all the cool stuff (smh). Most of us just laugh, recognizing that this kind of imagination is just that…fantasy. For the few whose hopes were unrealistically raised, today is a disappointing day. The future is here…but it looks a lot like the present. I cannot help but look at my kids and the kids at the church where I serve. In a very real way, we are providing for them a “Back to the Future” moment each time we teach them, train them, disciple them in their growth as both humans and believers. I’ve heard it said that we are not raising kids; we are raising future adults. That being said, I wonder what exactly it is we are raising them to. Every apocalyptic movie I’ve watched over the past decade or two paints a pretty bleak picture of the future. It’s always either dark and dusty or artificially bright and platinum. Most people are dead or dying. Disease, war, and pollution have decimated the planet. It’s not a happy place (just check out the 2015 of Back to the Future II). Not much hope to pass on to the next generation. To save civilization, I would show its collapse. How do you think this vision was received? How do you think people responded to the prospect of imminent doom? They gobbled it up like a chocolate eclair! They didn’t fear their demise, they re-packaged it. It could be enjoyed as video-games, as TV shows, books, movies, the entire world wholeheartedly embraced the apocalypse and sprinting towards it with gleeful abandon. Meanwhile your earth was crumbling all around you….In every moment there’s the possibility of a better future, but you people won’t believe it. Tomorrowland’s answer was a political and ecological one. And while I am not opposed to these things, I don’t think it is the only answer. The reality is that, yes, while bad things are happening, there are also good things, amazing things, miraculous things happening all around us. But those things don’t get play on media. The feel-good movies don’t get the high ratings. The positive stories don’t get headlines. They are out there…but buried under piles of negativity. That means, if we want your kids to see a future that’s not the only future being portrayed by the media and projected to them every single day…we’re gonna have to dig those things out and share them. We are going to have to show them through our own lives and actions that however seemingly small the action or service is, it can make a difference. We are going to have to tell them that there is more than one story of the future and assure them that what awaits them doesn’t have to be awful and they have a part to play in that. We are going to need to remind them that they have Jesus and his kingdom doesn’t fade, doesn’t rust, doesn’t end in ruin. We are going to have to live like that kingdom is available for us “on earth as it is in heaven” as long as we are willing to be a part of it. And then, when they get to their future, instead of being disappointed or disillusioned, they will simply be living into the reality of the present, being the hands and feet of God in this world, no matter what it looks like, and seeking to welcome God’s kingdom to earth through their very lives. I’m not talking “pie in the sky” or “head in the sand” theology. I’m talking about the very real fact that God is present, always and forever, and we are never without hope of a better and brighter future because of Him. But for me, I think I want to change the tone of the conversation. Instead of starting with the “Here’s what’s wrong” routine, I think I want to start from the “Here’s what’s right” standpoint. Instead of pointing fingers, I want to extend grace as it has been extended to me. I want my kids to know what’s right in this world and that all hope is not lost because we serve a God of future and hope. Let’s get back to the future…the real future…and give our kids the tools to face whatever may come; good, bad, boring or exciting. And, if flying cars and rehydrated pizzas are there…well, yay for them!